Former Indian batsman VVS Laxman has backed Ambati Rayudu for the much talked about no.4 spot in the Indian line-up. There are still clouds hovering over the particular slot as numerous batters have auditioned for the role. But as far Laxman is concerned, Rayudu is the ideal candidate for the top spot. Recently, chief selector MSK Prasad fancied the idea of having Virat Kohli at the no.4 position. The Indian skipper has done exceedingly well at the no.3 spot and he can fit into the fourth spot if the need be. The likes of Dinesh Karthik, Manish Pandey, Shreyas Iyer, Suresh Raina and Ambati Rayudu have auditioned for the no.4 spot over the last year. With World Cup just a couple of months away, the selectors want to zero it down to one name. In 52 ODIs, Rayudu has scored 1661 runs at an average of 50.33. He has hit three centuries and 10 fifties and remained unbeaten on 10 occasions. Laxman feels Rayudu's game-changing innings against New Zealand in alien conditions will earn him a spot in the side. “Rayadu has been performing really well recently. He made his presence felt with a quality knock of 90 in the last ODI against New Zealand, with the knock emerging as a match-winning one. Rayadu has sealed the position,” he said. The upcoming home series against Australia will be crucial for the top contenders, including Rayudu. The likes of Rishabh Pant and KL Rahul will be looking to cement a place in the top-order. With Karthik out of the ODIs against Australia, one may say that Pant will be drafted in for the World Cup. But all said and done, the ODIs will be seen as the ideal dress rehearsal for the global event. World Cup 2019: Has Rayudu done enough to seal the number four spot? Rayudu vs Rahul: Who should be in India's 2019 World Cup squad ? 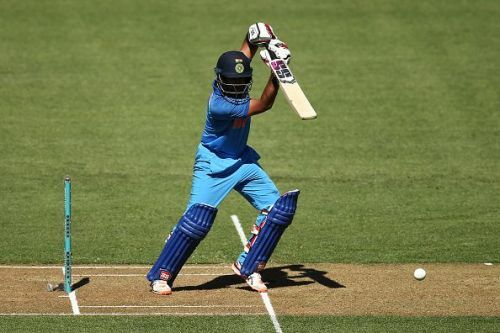 World Cup 2019: Is the no.4 slot of Indian batting lineup slipping out of Ambati Rayudu's hands?